• The Center for World Health & Medicine at Saint Louis University (www.cwhm.org). Development of inhibitors of plasmepsin V as novel anti-malarial agents. • Dr. John J. Talley. Development of 3rd generation Cox-2 selective inhibitors. • Professor Jufang He at Hong Kong Polytechnic University (http://www.polyu.edu.hk). Advancement of CCKBR agonists for the improvement of memory. • Dr. Jinsong Zhu, CEO of Plexera Inc. (www.plexera.com). Development of compound micro-array chips for repositioning of clinical candidate compounds. • Professor Anne-Marie Malfait, PhD, MD at Rush Medical Center (www.rush.edu). Understanding the biochemistry of OA pain using transgenic mice. 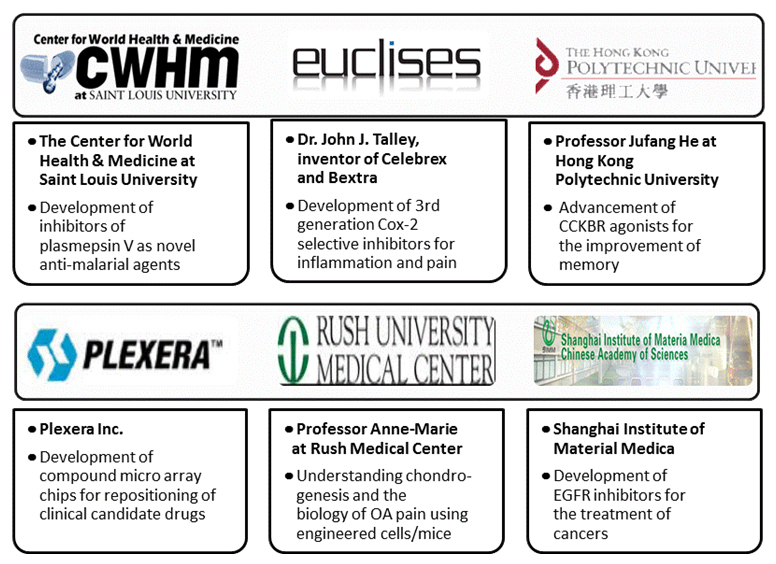 International Collaborations: Partnerships with leading institutions in USA and China.